Use HTML markup in the validation message to display an image. Using a CSS class to display an image. The Employee model class contains three properties namely EmployeeID, FirstName and LastName. To keep the model clean you won't add data annotations here. You will add them to metadata class(s) as discussed later. Notice how images are being displayed by ValidationMessageFor() and ValidationSummary() helpers. Notice how ErrorMessage property of [StringLength] attribute includes an image HTML markup tag. 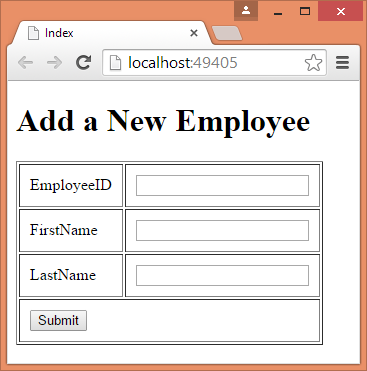 Once created attach this metadata class to the Employee class using [MetadataType] attribute. Add the Index view and change its content as per the following markup. 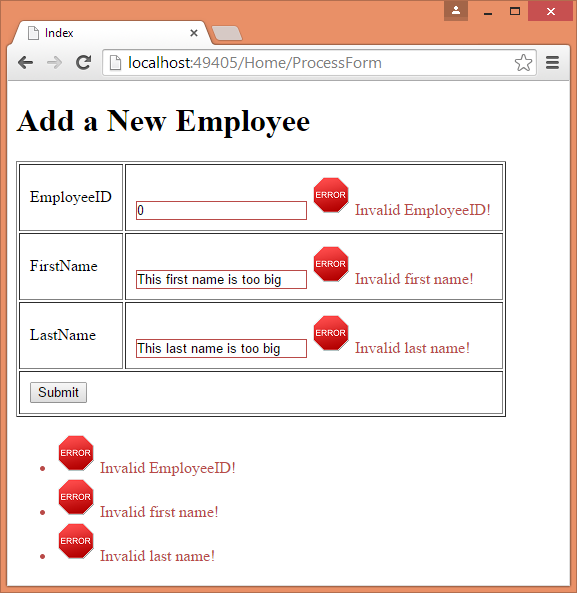 That's because ASP.NET MVC by default HTML encodes the output of validation helpers. So, your embedded HTML fragment is not treated as actual HTML and no image is displayed. Now let's fix this problem with a bit of clever code. Notice the above like of code carefully. The return value of ValidationMessageFor() is MvcHtmlString. Calling ToHtmlString() method on it gives you the HTML encoded plain string. This HTML encoded plain string is then decoded using HtmlDecode() method of HttpUtility object. Doing so will give us raw HTML string. This string is finally sent to the response stream using Raw() helper. If you run the application now, you will see the validation errors being displayed as per Figure 2 of this article. In the above technique you embedded HTML fragment in the data annotation attributes. 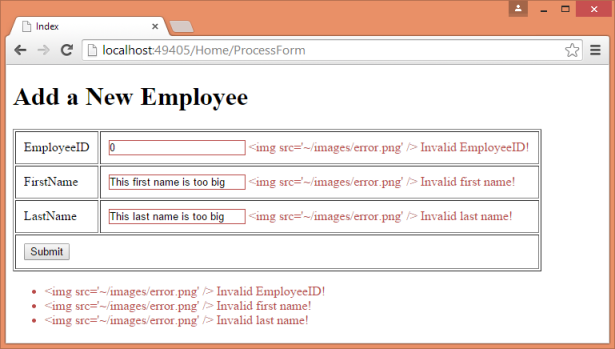 You may want to avoid this "ugly" way of specifying validation errors in some cases. If so, you can still achieve almost identical results using CSS classes. As you can see, you no longer embed HTML markup in the validation messages. Also revert back the Index view as it was before using the Raw() helper. Remember that these CSS class names are assumed by the validation helpers and hence you should keep them exactly as shown above. The field-validation-error CSS class is applied to ValidationMessageFor() helpers whenever there is any validation error. SImilarly, validation-summary-errors CSS class is applied to ValidationSummary() whenever there is any validation error. Notice the style rules shown in bold letters. You are using a background image for the field level validations and the validation summary. You may need to adjust the padding as per your image dimensions. Note that there will be minor differences between the way images are shown in the previous technique and this technique. For example, in this technique ValidationSummary() will display just a single instance image for all the messages instead of one image per message (as in the previous technique). That's it! Run the application and see if images are shown as expected.